The Royal Burgh of Dornoch is an historic small town on the edge of the Dornoch Firth, a designated National Scenic Area in the Highlands of Scotland. Its tranquil location, scenery and climate have attracted visitors for decades. Some come to test their golfing skills on Royal Dornoch's championship course, or to walk and view wildlife in the National Nature Reserve at nearby Loch Fleet. Others simply want to relax and enjoy our unhurried way of life. 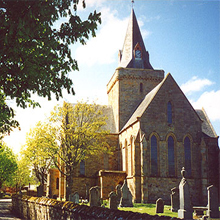 Once the spiritual and administrative capital of Sutherland, Dornoch remains a thriving community today. Small in population (under 2500) but large in hospitality, Dornoch offers visitors and residents a wide range of shops and businesses, five hotels, two golf courses, two schools, a further and higher education college and an award-winning sandy beach. Its fine buildings include the 13th Century cathedral, a bishop's palace (now a hotel), courthouse and old town jail. Sandstone cottages and town houses line its peaceful streets and lanes.